Employees of the pharmaceutical giant Teva signaled they will continue their protests against the planned closure of the company’s operations in Jerusalem, a day after members of Israel’s largest labor union, the Histadrut, launched a partial strike around the country Sunday morning, before returning to work at noon. Hundreds of Teva employees barricaded themselves in one of Teva’s two Jerusalem factories slated for closure Sunday, demanding that company cancel the planned closure of the facility and layoffs. Teva, which was poised a year ago to become the world’s largest generic-drug manufacturer in the world, has suffered from the decline in generic-drug prices and the loss of exclusive rights to the drug Copaxone. The company recently announced it would terminate one-quarter of its global workforce, including 1,750 Israeli employees – most of them from the company’s Jerusalem facilities. 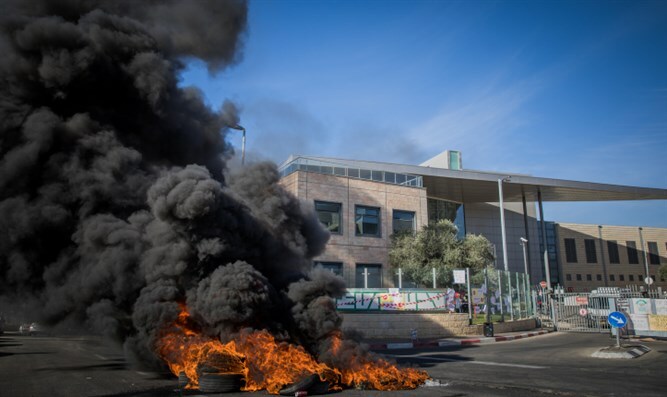 On Monday, Itzik Ben Simon, a representative of the striking Teva workers now barricaded in the Teva Tabliot factory, told Channel 2 that protesters were demanding that Finance Minister Moshe Kahlon (Kulanu) intervene to ensure that Teva’s Jerusalem facilities remain open “forever”. If the facility is closed, however, employees hinted that they could blow up the building.